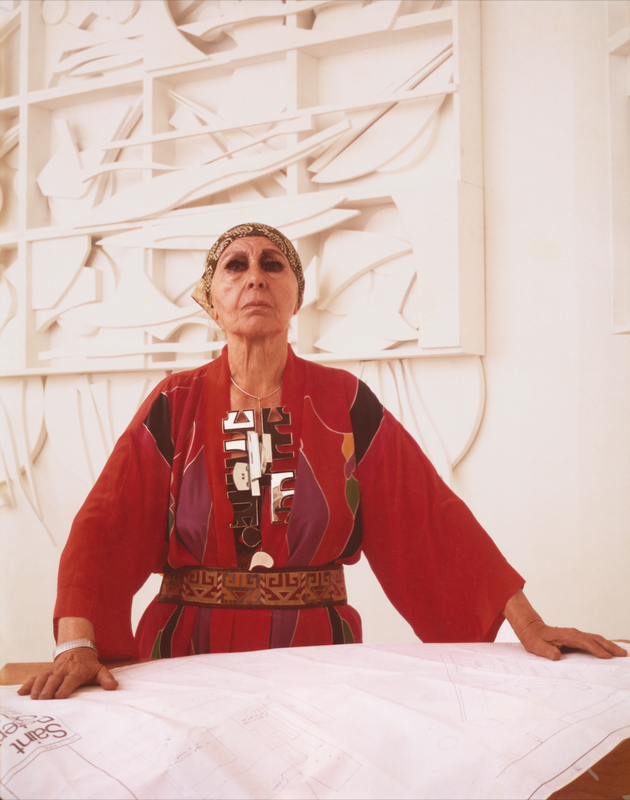 Louise Nevelson (nee, Leah Berliawsky) fled pogroms in her native Ukraine to become the 20th century’s premier sculptor of the Abstract Expressionist movement. With her unique approach to cubism and surrealism, Nevelson translated her particular experience as a refugee, with an appreciation of materials discarded from everyday life, into groundbreaking sculptural environments—like the one still extant in Nevelson Chapel. Nevelson was brought by her parents from Ukraine to Rockland, Maine. But, her heart, from an early age, was set on New York City. She managed to find her way to New York during her marriage to Charles Nevelson, from whom she was later divorced. Her relationship with New York City was one of lifelong devotion. Even in the city’s dark times, Nevelson saw its power and beauty. Hence her commitment to the Chapel project that would be a defiant spark of urban renewal as the city faced bankruptcy in the 1970s. Best known for her wooden assemblages of discarded objects found on the streets of New York, Nevelson would use black or white paint to emphasize the interplay of light and shadow along the contours of each piece. Gold spray paint—or in the unique case of Nevelson Chapel, gold leaf—was also used by Nevelson to accentuate certain elements, capturing light in a different way. She established her trademark style in the 1950s, expanding and experimenting until her death nearly forty years later. With her Moon Garden + One installation at the former Grand Central Moderns Gallery, Nevelson invented the idea of sculpture presented as complete environment and burst onto the international stage, never to retreat. Nevelson championed public art. She never lost sight of the depression-era WPA initiatives that provided some of her earliest artistic outlets. Although Nevelson coexisted with the rise of feminism in the 1960s and 70s, she didn’t consider herself “a feminist.” Rather, when asked about her relationship to the movement, Nevelson replied, “I am feminism.” Ultimately, Nevelson allowed the boundaries between herself, her beliefs and her art to become porous, reinventing herself with a persona that embodied and transcended a life lived on a grand scale. As today’s art historians re-examine lost greats of the modern era, Louise Nevelson is continually referenced as a model artist of the 20th century, someone who includes in her oeuvre the great value and energy in the life of the city, and an equal value and importance in the human aspect of that life. Nevelson created Chapel of the Good Shepherd in 1977 as a commissioned piece for the “new” Saint Peter’s Church at Citigroup Center (now 601 Lexington Avenue) in Midtown Manhattan. In so doing she built a human-scaled space of quiet contemplation among the impersonal skyscrapers of the modern city. Today, as historians of art and architecture are recognizing the gradual loss of our cities’ human-scale spaces to an urbanism focused on security and pressured by commercialism, Nevelson’s legacy offers respite and inspiration. A comprehensive sculptural environment in the heart of Saint Peter's Church.